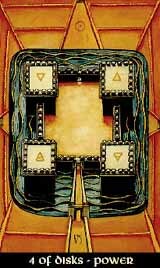 The Four of Disks has reached the realm of Chesed, the fields of condensation, growth and stability, standing in the structural discipline of the Four. The work of the Three has paid off, the fruits are rich and manifold. Therefore, the Four of Disks represent success, establishment, proficiency, comfort and security not only in material values, but in familiar relations and profession either. Thus, the power it supplies is grown from peace and security, the welldeserved reward for good work and concentrated effort. It has nothing to do with any ruling force, and it won't ask for it. One the dark side, the four of Disks admonishs that any overrated attachment to comfort or possession results in fear of loss and failure, avarice, greed, hoarding, the comfortable power of peace turns into an ugly force that is directed against oneself.